This was a VERY difficult list to create… first, I began gathering the names of all my favorite authors. After re-checking my bookcases and bookshelf blog, I found that I have well over 100 names! Now, this might not sound like a lot to some of you, but I was astounded that I had that many favorite authors – those whom I refuse to part with their books! I began paring down… whew, that was rough! What I really wanted to do was to name them all — but that seemed to defeat the purpose of listing the TOP chosen few. I tried — I really did — and I still didn’t get everyone on the list that I hoped to! Today I am reviewing Lost Christmas Memories, the fourth — and final — novel in the Gold Country Cowboys series by Dana Mentink. Tracy Wilson witnessed a murder—but after a head injury, she can’t remember what she saw. Now someone plans to silence her for good, and only cowboy Keegan Thorn believes her. With a killer after her at Christmas, Tracy is running out of time to remember… and falling dangerously hard for the cowboy who could break her heart. 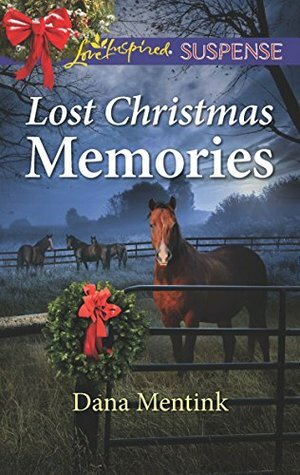 I love reading suspense stories by Dana Mentink… and she doesn’t disappoint with her newest release, Lost Christmas Memories. The fact that I began reading it tonight and didn’t stop until I reached the end — at 12:58 AM — should tell you that this story is an amazing one… and one you won’t want to put down until the end, either. You won’t believe everything that happens to Tracy Wilson! First, she witnesses a murder, then she’s involved in a car accident and can’t remember anything about the murder, then no one really believes her story — except for Keegan Thorn. But Keegan has his own set of problems, and Tracy’s grandpa almost convinces her that Keegan is the one who’s endangering her life. And that Keegan isn’t the nice guy she thinks he is! Oh mercy! This is such a great story! And as soon as I have time, I’m going to go back and read all four stories in order… Cowboy Christmas Guardian, Treacherous Trails, Cowboy Bodyguard, and Lost Christmas Memories (again). This is an awesome series! 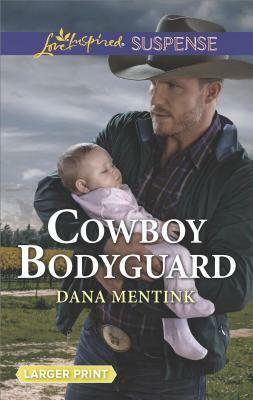 Today I am reviewing Cowboy Bodyguard, the third novel in the Gold Country Cowboys series by Dana Mentink. With her secret husband’s help! In this Gold Country Cowboys novel, Jack Thorn gets a surprise call from the woman he married in secret years ago. Shannon Livingston needs his protection for herself and the baby she’s hiding from a biker gang targeting the mother. Now Jack must help Shannon, even if shielding her means pretending to be a true husband to the only woman he’s ever loved..
WOW! This is one scary situation! I’m glad I don’t work in a place where the bad guys show up! This series has been totally awesome! In the last book we read Owen Thorn’s story… now it’s his brother’s turn. Jack Thorn is every bit the cowboy — and here — that you would expect. When his wife, whom he married in secret years ago, contacts him that she’s heading his way, he’s more than a little surprised, but he goes to meet her. And when she shows up with a baby, well, he doesn’t let her down. Now he’s determined to protect her and the baby she’s protecting, from the biker gang who’s after them. I don’t want to spoil the story for you, so pick up your own copy and dig in! But you’ll want to read Cowboy Christmas Guardian and Treacherous Trails first to get stories from other secondary characters in this book. 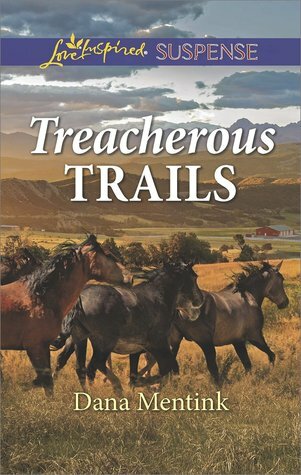 Today I am reviewing Treacherous Trails, the second novel in the Gold Country Cowboys series by Dana Mentink. In this Gold Country Cowboys story, farrier Ella Cahill is accused of murder—and only former marine Owen Thorn, her brother’s best friend, can help clear her name. Now with someone trying to kill Ella, Owen must protect her…despite his promise to her brother to stay away from her. But can they work together to find the true killer before she becomes the next to die? WOW! That is one nasty killer! I’m glad I didn’t choose to read this at bedtime. . . this is definitely a great story, but one that scared the heebee jeebee’s out of me! This new series is really suspenseful. . . and awesome! The code of the West rules the land for these men! And thank goodness it does! Owen Thorn certainly lives by the code. Ella has known Owen practically her whole life; the kid sister who, of course, had a crush on big, brooding brother figure. Now he’s determined to protect her from the big, bad guys. And that’s a good thing — because the big, bad guy is determined to get her! And that’s all I’m telling. . . I don’t want to spoil the story for you, so pick up your own copy and dig in! 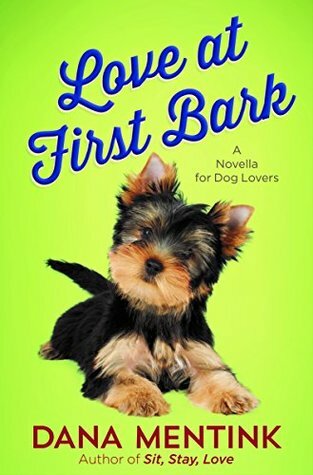 Today I am reviewing Love at First Bark… a novella for Dog Lovers by Dana Mentink. When Marcy Deveraux’s romance series catapults to the top of the New York Times bestseller list, no one is more surprised than Marcy herself. After all, she barely passed high school, flunked the driving test four times, and fell into a pool at her sister’s wedding. Marcy is keen to continue her literary success, but she cannot think of a single idea for her next book. Hounded by her agent, family, and friends, she decides to sequester herself in a rustic cabin in the mountains. There, she finds herself face-to-snout with a surprise visitor—a rascally black dog who must have escaped from his owner at a nearby campground. Enter hunky cowboy Jackson Parker, who runs the stables for the campground and helps Marcy survive the antics of the ill-behaved, zany dog. There’s something tender and gentle about this man, who could easily grace the cover of any romance novel. Soon Jackson has Marcy rethinking her own beliefs about what heroes are really made of…and what God intends for her life. It’s cowboys, canines, and capers galore in this charming novella for animal lovers. Oh my! Love at First Bark is the cutest dog story I’ve read all year! I love this story! It’s not often that we read about a man who’s shy. . . and a gentleman! 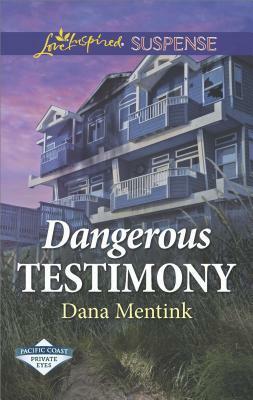 Today I am reviewing Dangerous Testimony, the fourth book in the Pacific Coast Private Eyes series by Dana Mentink. Four weeks before she’s set to testify at a gang murder trial, someone is determined to make sure that Candace Gallagher Andrews never takes the stand. When nowhere is safe for the private investigator or her little girl, Candace turns to the only person she can trustlongtime friend and former navy SEAL Marco Quidel. For Marco, protecting Candace is not just another duty. As the trial date nears and the killer stalks ever closer, Marco knows fear for the first timethe fear of losing Candace and her daughter. But while Marco begins seeing Candace as more than just a friend, her late husband’s memory is never far from her mind. So he must keep Candace alive—and not get emotionally involved—long enough to put away a killer. In this fourth book of the series, tension mounts as Jay Rico convinces Candace that her entire family is in danger unless she does exactly as he says. . . and she’s determined to protect her family. I’d love to say more, but I’m afraid if I do, I’ll give too much away! Get this book! Read it! Today! Dana Mentink creates complex, interesting characters – and if you haven’t read the other stories in this series, let me encourage you to do so… you can read just one – or all four in sequence – but just do it! PS… Dana, I didn’t give away Marco’s nickname — but I love it! 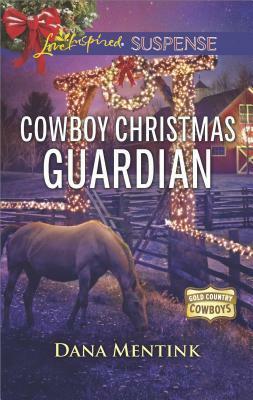 Today I am reviewing Cowboy Christmas Guardian, the first novel in the Gold Country Cowboys series by Dana Mentink. Someone is dead set on stopping Shelby Arroyo from doing her job: assessing mineral rights in a mine in gold country. But after rancher Barrett Thorn rescues her from an attack, the handsome widowed cowboy seems to feel responsible for her. That is, until he discovers she’s from the family that he’ll never forgive for his wife’s death. As the threats against Shelby escalate, cowboy honor and an unexpected attraction keep Barrett by her side, even at his own risk. And since Shelby won’t back down, Barrett must protect the brave, loyal woman he has no business falling for…a woman someone wants to kill by Christmas. I am a huge fan of Dana Mentink! And Barrett Thorn certainly lives by this code. When Shelby Arroyo finds herself in trouble, Barrett rides in on his horse to rescue her! And when she’s determined to finish her job, Barrett continues to protect her from those who are trying to harm her. Oh my goodness! I love this story! I’m already looking forward to the next story in the series..